Shopping for Harry Potter Busts? A house-elf to do your bidding! 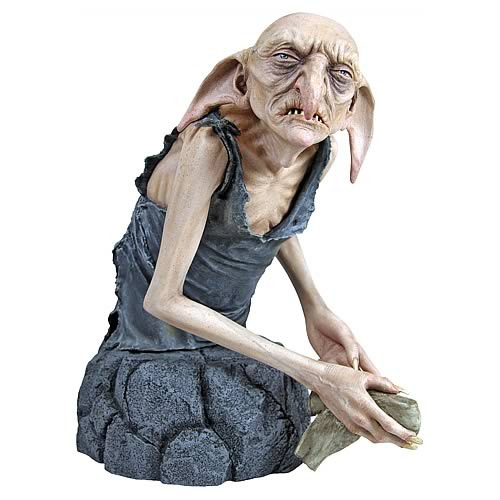 Limited edition mini bust of Kreacher, the grumpy servant to Sirius Black. Every Harry Potter collection needs one! First seen in Harry Potter and the Order of the Phoenix, Kreacher is the grumpy servant to Sirius Black, and a true curmudgeon of a house-elf if there ever was one. During the climactic Battle of Hogwarts (as featured in Harry Potter and the Deathly Hallows), Kreacher rallies a house-elf army to clash with the evil-doing Death Eaters. At 6 1/2-inches tall, this limited edition, polystone mini bust from Gentle Giant is a perfect compliment to any Harry Potter collection! Certificate of authenticity included. Limited edition of 600 pieces.